Imaging the transcriptome in situ with high accuracy has been a major challenge in single-cell biology, which is particularly hindered by the limits of optical resolution and the density of transcripts in single cells. Here we demonstrate an evolution of sequential fluorescence in situ hybridization (seqFISH+). Caltech researchers show that seqFISH+ can image mRNAs for 10,000 genes in single cells—with high accuracy and sub-diffraction-limit resolution—in the cortex, subventricular zone and olfactory bulb of mouse brain, using a standard confocal microscope. 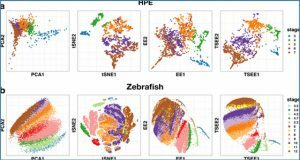 The transcriptome-level profiling of seqFISH+ allows unbiased identification of cell classes and their spatial organization in tissues. In addition, seqFISH+ reveals subcellular mRNA localization patterns in cells and ligand–receptor pairs across neighbouring cells. 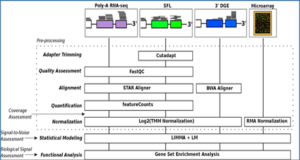 This technology demonstrates the ability to generate spatial cell atlases and to perform discovery-driven studies of biological processes in situ. a, Schematic of the seqFISH+ protocol. Primary probes (24 per gene) against 10,000 genes are hybridized in cells. Overhang sequences (I–IV) on the primary probes correspond to four rounds of barcoding. Only one twentieth of the total genes in each fluorescent channel are labelled by readout probes in each pseudocolour hybridization readout round (hyb), lowering the density of transcripts in each image. mRNA dots in each pseudocolour can then be localized by Gaussian fitting and collapsed into a super-resolved image (dashed blue outline). 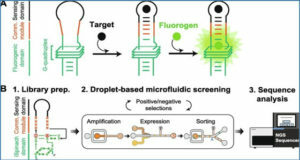 Each gene is barcoded within only one fluorescent channel (Methods). b, Comparison with seqFISH implemented with expansion microscopy (seqFISH-expansion, green line), covering 24,000 genes. Imaging is eightfold faster using seqFISH+ with 60 pseudocolours (blue line) than with seqFISH-expansion. 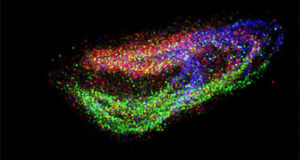 c, Image of a NIH/3T3 cell from one round of hybridization (n = 227 cells; scale bar, 10 μm). 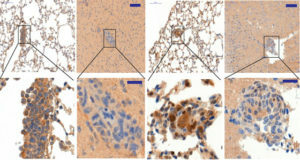 Expanded inset shows individual mRNAs (scale bar, 1 μm). Different mRNAs are decoded within a diffraction-limited region, magnified from the inset (scale bars, 100 nm). 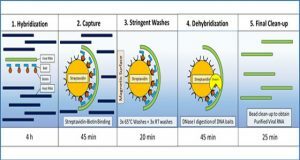 The number in each panel corresponds to the pseudocolour round in which each mRNA was detected, with no dots being detected during the other pseudocolour rounds in the channel (640 nm).